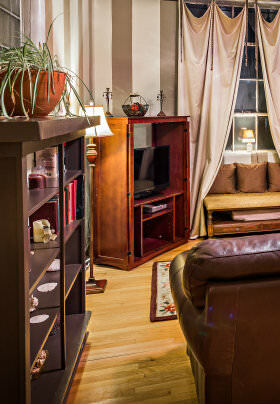 A luxurious and quaint cottage with a private backyard and king-size bed. Perfect for an extended stay or a romantic New Mexico honeymoon, this historic cast-stone home is nestled behind the Spy House and the Heritage House. Originally, it was the carriage house to the Spy House; however, in the late 30’s, it was converted into a small private cottage. The Carriage House still contains some of the original kitchen cabinets, as well as the original porcelain mosaic tile in the bathroom. The bedroom features a cozy king-size bed. Next to the bedroom is a large living area with a daybed, which can be converted into a king-size bed or two twin beds, for additional sleeping arrangements. 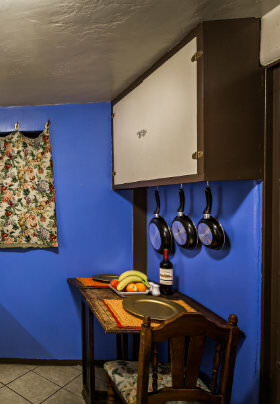 The kitchen offers a stove, microwave, coffee maker, and refrigerator stocked with a variety of drinks. Dishes are also provided, so that you may prepare personal food during your stay. The Carriage House also includes a private fenced-in backyard, with a small table – perfect for a meal outside or for a few hours of relaxation.